The night journey (al-isra) and the ascension (al-mi’raj) of the Prophet is observed on the 27th day in the Islamic month of Rajab (falling in 2018 on Friday, April 13). This is an event of great spiritual significance because the exalted experience of Prophet Muhammad (s.a.s.) is viewed by all Muslims as an example of his elevated status. Significant events of this nature in the life of the Prophet are a source of inspiration for the believers to excel in their quest for spiritual enlightenment and also serve as a model for the believers to emulate. The attainment of this exalted status is possible for every believer who correctly practice his or her Faith in accordance with the proper guidance of Allah through His Prophet and the designated successors (i.e. the Hereditary Imams). Fragment from a manuscript of Bustan of Sadi extolling the Prophet’s miraculous ascension to the heavens (mi’raj) Image: Wikipedia. Please click for article. Eastern Canada shown in green on map on left consists of the provinces of New Brunswick, Newfoundland and Labrador, Nova Scotia, Ontario, Prince Edward Island, and Quebec. The total population is 23,946,177 (2016), and approximately 40-45,000 Ismailis live in these provinces. Map (left) Connormah – Wikipedia, CC BY 1.0, https://commons.wikimedia.org/w/index.php?curid=19857457, and (right) Natural Resources, Canada. The act of apologizing when one thinks that one was not at fault, and the act of exercising forgiveness when one feels that they have been wronged, are probably the most difficult to struggle with. However, each one of us has to realize that when there are conflicts, especially within a family, the burden of disunity is the greatest on parents because their love for all their children is absolute. Now consider that in the context of Hazar Imam, who addresses all Ismailis as his spiritual children! Of course, Mawlana Hazar Imam was addressing an audience that had passed through a period of civil strife in Tajikistan. However, this principle is as fundamentally important in our daily attitudes to our families and friends. The Qur’anic ayat quoted earlier “tie relations with those who severe theirs with you” imposes upon us a moral obligation to forgive. That act of courage would be in the truest and finest tradition of our faith. With that kind spirit in our heart, we will truly lavish in the love, grace, and blessing of Mawlana Hazar Imam when he is with us in a few days. Forgiveness will lead to greater unity within families and the jamat. It is within the framework of united families and Jamats that Mawlana Hazar Imam wishes us to attain spiritual as well as worldly success and happiness. Date posted: November 4, 2017. Please click on image for links to more than 100 photo essays and hundreds of rare photos at http://www.simergphotos.com. Date posted: May 14, 2016. “This is a time of new freedoms, but it is also one in which new choices must be made wisely. In exercising freedom and making choices, our institutions must be guided, as they have been in the past, by the teachings of the Prophet Muhammad (Peace of Allah be upon him), and the tradition of our tariqah, which is the tradition of Hazrat Ali: A thinking Islam and a spiritual Islam – an Islam that teaches compassion, tolerance and the dignity of man – Allah’s noblest creation.” — His Highness the Aga Khan on the occasion of the 25th anniversary of the Aga Khan Foundation, May 14, 1992. Hazrat Ali’s aphorisms and wise counsels got translated into numerous languages across the Muslim world. The Kalame Mawla is a moving poetic rendition of his teachings in Hindustani. The work exhorts the believers to observe virtues such as brotherhood, honesty and generosity. The image shown above is from the manuscript collection at the Institute of Ismaili Studies and written in a beautiful Khojki hand in Bombay. It was copied in 1908 samvat/1851 by Khoja Alahrakhea Koriji. Shah-e Dul Dul Sawar (verses 113 & 130) – the rider of (the horse) Dul Dul; etc. Photo: The Trustees of the British Museum. Copyright. You will find him your helper in calamities. O Ali, O Ali, O Ali. Date posted: April 19, 2016. A greeting and prayer for my parents from an Ismaili student in Vancouver. On auspicious occasions such as Navroz, Imamat Day and Salgirah a team of volunteers sets out to deliver trays of delicious food around the Greater Vancouver area to the aged and the sick who cannot attend the jamati functions due to ill-health and other limitations. These deliveries remind the recipients they are part and parcel of a greater brotherhood which has not forgotten them. The volunteer who came by to my mum was in his last leg of deliveries to 84 homes – this is just from one out of several Vancouver area jamatkhanas. Thank you to the volunteers for preparing the food, and delivering it to hundreds of homes, and to students who design beautiful cards with good wishes and prayers. Keep up the excellent work of lighting up the hearts and souls of hundreds of jamati members on this most auspicious occasion of Navroz. On behalf of everyone whose hearts you have warmed up, we say to you and your families Navroz Mubarak, and may you be blessed with happiness and success in all walks of life. Date posted: March 19, 2016. We welcome your feedback, please click Leave a comment. 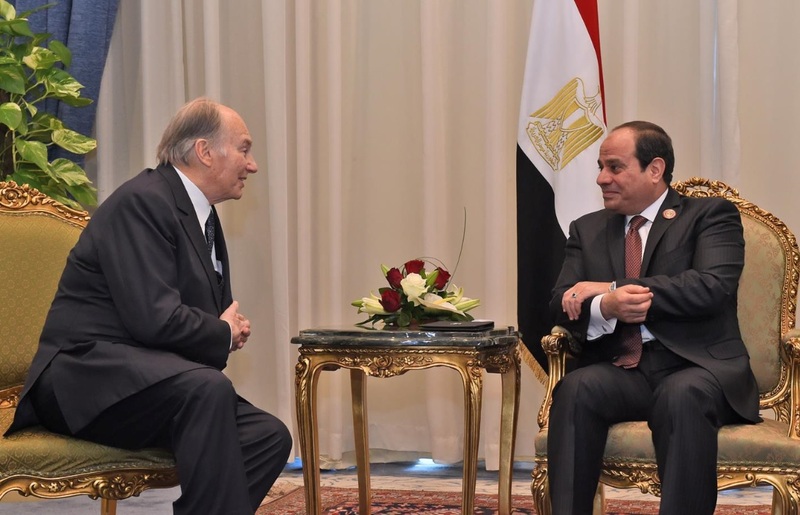 Mawlana Hazar Imam, His Highness the Aga Khan, pictured with Egypt’s President al-Sisi on February 20, 2016. Photo Credit: The Egyptian Presidency. 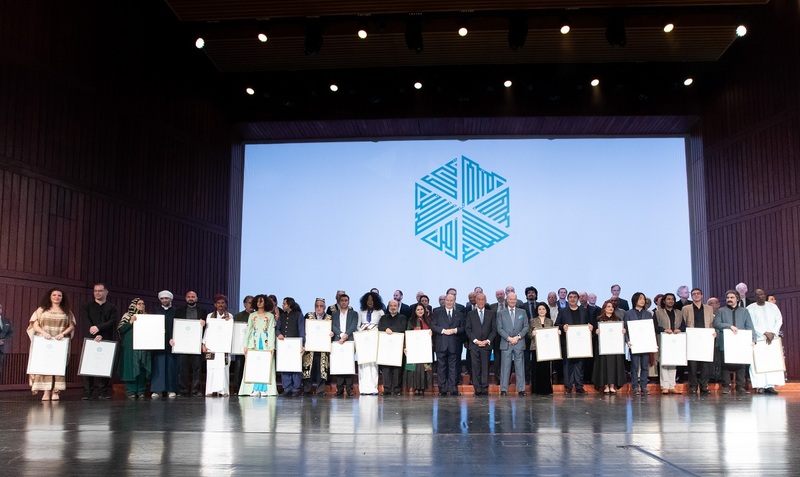 The 49th Ismaili Imam said that he was looking forward to boosting the Network’s activities in various Egyptian cities, referring to AKDN’s projects in Aswan. He added that the foundation plans to finance more projects for the needy segments, especially in the health and educational sectors. His Highness the Aga Khan was in Egypt to deliver the keynote address at the Africa 2016 investment forum in Sharm el Sheikh. Thematic excerpts of the speech will appear on this website during the week of February 22, 2016. 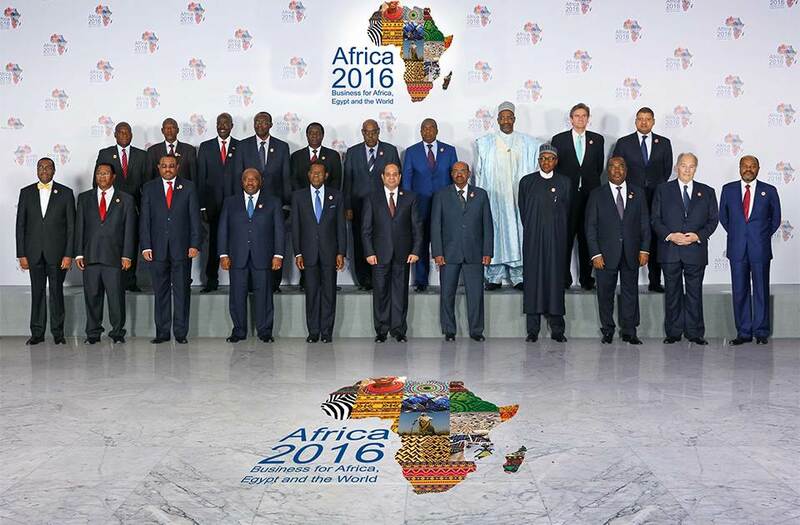 Egyptian President Abdel Fattah al-Sisi (C) takes a memorial photo with other heads of state and government and the participating delegations during the Africa 2016 Business for Africa, Egypt and the World Forum in the Red Sea resort of Sharm el-Sheikh, Egypt, February 20, 2016. His Highness the Aga Khan is pictured second from right in the front row. The 49th Ismaili Imam will be giving a key note speech at the forum on Sunday, February 21, 2016 at approximately 9:00 am (Cairo Time). Photo Credit: The Egyptian Presidency. 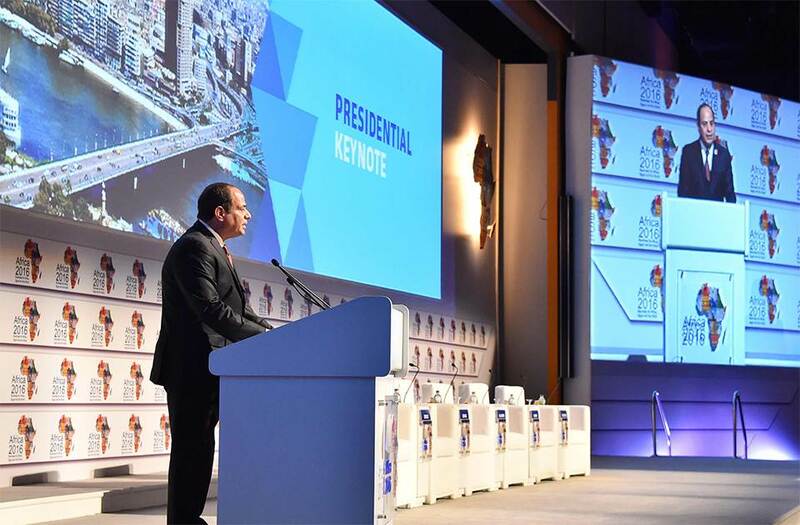 Egyptian President Abdel-Fattah El-Sisi delivers his speech during the opening session of the African international business forum in the Red Sea resort of Sharm El-Sheikh in the South Sinai governorate of Egypt, 20 February 2016. Photo Credit: The Egyptian presidency. Last updated: February 21, 2016. Report compiled from the website of Egypt’s State Information Service, http://www.sis.gov.eg/en/. Major excavation activities have been underway for the past few years resulting in interesting archaeological discoveries. Here we see the legendary water basin which filled itself up by collecting rainwater and melting snow from channels and canals on the mountains. Photo: Muslim Harji, Montreal, PQ, Canada. © Copyright. “The Nizari [Ismailis] excelled in the fields of theology, philosophy, architecture and science, but their opponents demonized them as bloodthirsty extremist religious murderers…The returning Crusaders brought back the legend of the pothead assassins, partly because they loved to believe imaginative romantic tales of the East…In 1256, Genghis Khan’s grandson, Hulagu, destroyed the Nizali mountain castles, one at a time. Their political and military power was permanently broken (although today, some several million Nizalis still survive in some 25 countries across Asia, Africa, Europe and North America). Timeline by Dr. Ali M. Rajput, Birmingham, England. “In 1273, Marco Polo visited Alamut, and brought back the story of how hashish was used to attract potential killers…After, Dante was the first to use the word “assassin” in the 19th Canto of The Inferno in his Divine Comedy. The word “assassin” remained in various European languages, right through to Dan Brown, author of the Da Vinci Code, who mentions the Assassins in his book, Angels and Demons. But there are a few reasons why the hashish-assassin myth is almost certainly wrong….If hashish is given in a large enough dose to cause unconsciousness, it will first cause nausea and hallucinations – which are usually very scary and unpleasant to the unsuspecting user.” — Excerpts from Dr. Karl S. Kruszelnicki’s “Hashish Assassin – Pulling Back the Silk Curtain”, broadcast on ABC Science Australia. Dr. Karl is Julius Sumner Miller Fellow, School of Physics, University of Sydney. Photo: Muslim Harji, Montreal, PQ, Canada. © Copyright. Editor’s note: The following piece by Valerie Gonzalez has been adapted from her review of the book Eagle’s Nest – Ismaili Castles in Iran and Syria by the late Professor Peter Peter Wiley, who had spent nearly a lifetime discovering and investigating the Ismaili castles of Iran and Syria. Professor Wiley passed away on April 23, 2009, at the age 86. Valerie’s copyright piece originally appeared in REMMM (Issue 123|July 2008) and was reproduced on this blog in full (see link below) with the kind permission of Revue des mondes musulmans et de la Méditerranée. The Castle of Alamut, nested on the top of the colossal mass of granite rock, became the centre of Nizari Ismaili activity after the fall of the Fatimid Empire. It is not until you come to the foot of this colossal mass of stone that you realize the immensity and impregnability of the fortress at its summit. Photo: Muslim Harji, Montreal, PQ, Canada. © Copyright. Muslim Harji, Montreal, PQ, Canada. © Copyright. Old myths are very difficult to deconstruct, even when historical evidence reveals the absurdity of their foundations. The infamous “assassin” legend that from the Middle Ages soils the memory of the Nizari Ismaili community is an example of this incorrigible defect of the collective consciousnesses. The image presented by both Christian and Muslim chroniclers of the Ismailis as unscrupulous terrorists is unfortunate if their sole fault lay in surviving as a distinct political and religious community within a hostile and troubled environment. The Crusaders, Sunnis and Seldjuk Turks naturally saw in this Shi’ite minority a threat to their establishment and expended great efforts in eliminating the Ismaili State from Iran and Syria. In addition to the pressures exerted by the great powers holding sway over the Middle East, in the 13th century, the Ismailis had to confront the Mongol threat which finally overwhelmed them. It is not wonder that in such a context they deployed the most efficient means of defense available to maintain not only the network of their strongholds and basis of their State, but also their faith and culture, the very sense of existence. In practice however, they were no more immoral or cruel than their contemporaries. They simply proved tremendously clever and obstinate in facing adversity and in struggling against forces vastly more powerful than their own. And it is probably for this reason that the Nizari Ismaili community were subject to demonization. Much scholarship was required to unravel the dark mystery of the medieval Ismaili community. Numerous historical essays and archeological reports, among them Fahrad Daftari’s extensive works, have provided an accurate view of the Ismailis within the Islamic tradition. But assuredly the latest release on the subject, Peter Willey’s book Eagle’s Nest: Ismaili Castles in Iran and Syria, brings invaluable new insights by accurately portraying the environment in which the life and struggles of the Ismaili faithful took place. There is no question but that this book offers a convincing tool for the deconstruction of the false myths which surround the cult of the Assassins. More than a mere treatise on the archaeology of the Ismaili castles in Iran and Syria, Willey’s book shows multiple qualities. As an academic work, it fulfills its main objective which is to present the results of a meticulous description and observation of these fortified sites. The considerable amount of information contained in the volume reflects a near life-time of research devoted to the subject. Not a single pile of stones or rubble has escaped Willey’s acute attention, or skillful restoration in clear prose of the forbidding grandeur of the Ismaili military architecture. Each remaining element of structure is analyzed and appropriately re-situated in the initial order both of the architectural organization of the building itself and of its broader setting within the coherent chain of fortresses spread over Ismaili territories. The material and documentation at the author’s disposal, including building scale, purpose, population levels and strategic importance have been patiently collected in order to present a reliable picture of the complex network of Ismaili strongholds. Maps, ground plans, photographs and even artists’ impressions and drawings complete the written work together with four appendices which include the castles’ inventory, a list of Willey’s expeditions and two catalogues of the ceramic and coin artifacts dating from the Alamut Period found at the site. As seen on NASA’s Astronomy Picture of the Day and the National Geographic News, a meteor’s streak and the arc of the Milky Way hang over the imposing mountain fortress of Alamut in this starry scene. Photo: Babak Tafreshi/Dreamview.net . Copyright. Beyond the high quality scientific report based on the archaeological record, Eagle’s Nest offers a brilliant reconstitution of Ismaili material culture from an historical, intellectual and sociological point of view, from the 11th century through the Mongol destructions of the mid 13th century. Willey restitutes the very meaning of the architecture he studies through the history of its builders and inhabitants, pointing out the most significant events of their lifetimes and portraying the great spiritual and political leaders of the Ismaili community. Methodically and surely, Willey describes the intricate historical background of the Ismaili State in which multiple powers confronted or fought each other, including Seljuk Turks, ambitious Sunni and Shii’a rulers, Crusaders on the Mediterranean coast, to propose his own interpretation of the historical evidence. Where evidence lacks or where persistent misconceptions require redress, the author proposes and defends critical hypotheses. The historical and cultural dimension of Willey’ archaeological investigation is particularly enhanced by the presentation of certain situations and events as literary narratives, as he does in the beginning of chapter 2, “Hasan Sabbah and the Ismailis of Iran”. The passage in question relates the capture without bloodshed of the Alamut fortress under Seljuk authority and begins thus: “It was nearly noon on a hot day in the early summer of 1090. Mahdi, the lord of the castle of Alamut, was beginning to sweat a little” (p. 21). In this way, the author makes us relive the extraordinary event in a human atmosphere that is quite uncommon in scholarly works. A tribute to the great Ismaili dai, Hasan bin Sabbah who was responsible for establishing the Alamut state after the divisions in the Fatimid Empire led to its eventual demise. Hasan maintained that Imam Nizar and not Musteali was the rightful heir to Imam Mustansir billah, the 8th Fatimid Caliph. Photo: Muslim Harji, Montreal, PQ, Canada. © Copyright. Willey’s sensitivity to humanistic values is perceptible throughout the book, not only through the telling of the past but also in the lively narration of the research trips themselves. First, he pays considerable attention to the actual environment of the castles he visits, their awesome natural frame and the rural or urban settings of the surroundings that are presented with delight and consideration. Although most of the time the Ismaili vestiges are ghost constructions in remote, isolated regions, they are not at all presented by Willey as still life portraits. Rather, each fortress is an element in a busy, human landscape. As an example, where appropriate Willey writes about agriculture and local conditions in the surrounding villages for fortresses located in rural areas. Also, the local population and individuals involved in Willey’s expeditions frequently are mentioned as actors in the archaeological narrative. In this way, Willey underscores the support of both his team and the local community in contributing to the success of his research. Particularly moving is his attitude toward the people who help him visit inaccessible locations under difficult conditions and various orders, especially his work partner Adrianne Woodfine. More broadly, the practical aspects of each journey, the general organization and unexpected situations and encounters are meticulously recounted so that the book offers the live texture of a human adventure together with its purely scholarly content. Chapters 7 through 12 cover the various areas of the Iranian Ismaili strongholds. Willey naturally begins with the fortresses in the famous Alamut Valley of the Alborz Mountains, the fortress in which the infamous legend of the “Assassins” took place. Alamut fortress constituted the very heart of the Nizari State in Iran and was the seat of Hasan Sabbah. Alamut and its sister fortresses represented the epitome of Ismaili military science. Willey presents it with a rigorous method of sketching, measuring and enumeration of the construction’s features and structures, topography, architectural configuration, water equipment, cisterns, underground storage, garrison quarters and so on. The Alamut castle like many of the Ismaili strongholds contained facilities for religious activities and higher learning such as libraries. To support his observations, Willey quotes several times the Mongol historian, Juwayni, who witnessed the surrender of the Alamut fortress among other similar events. Although this chronicler was hostile to the Ismailis, his detailed reports offer an invaluable source of information. In particular he inspected the Alamut fortress’ interior prior to destruction and mentions, not without admiration, its remarkable facilities (p.100). Indeed, the sophistication of their architecture allowed the Ismailis to resist the fiercest attacks while ultimately succumbing to the formidable Mongol war machinery. Willey relates with great empathy for the desperate inhabitants the dramatic capture and systematic destruction of Alamut and other Ismaili strongholds. After Alamut, Willey investigates the other Iranian Ismaili castles of the regions of Qumes, Khorassan, Qohistan and in the surroundings of the Seldjuk capital Isfahan. Willey terminates his book with a moving epilogue in which he shares a few of the thoughts, feelings and questions raised in his heart and mind by the exceptional fate of the Ismailis. 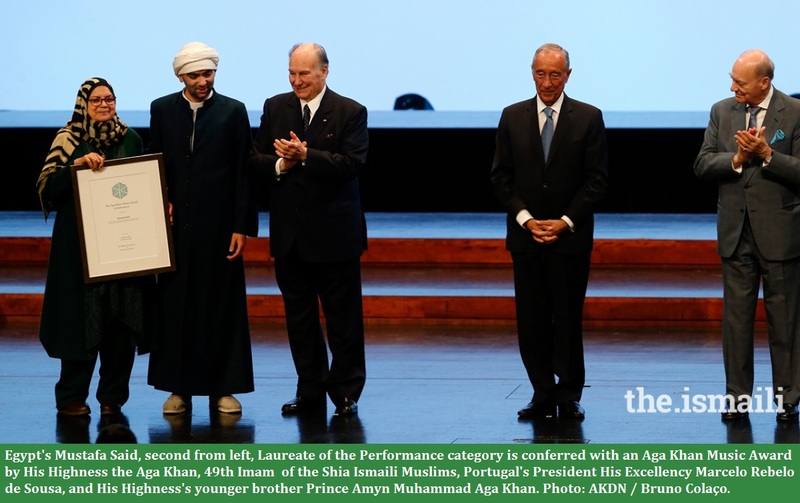 He naturally mentions the remarkable endeavor of the Aga Khan’s organization for the development of both Ismaili and Islamic culture in continuation with the educational tradition of the community since the Middle Ages. If, through such personal treatment, Willey hoped to clarify the historical issues surrounding Ismaili culture through the ages, he most assuredly succeeded. 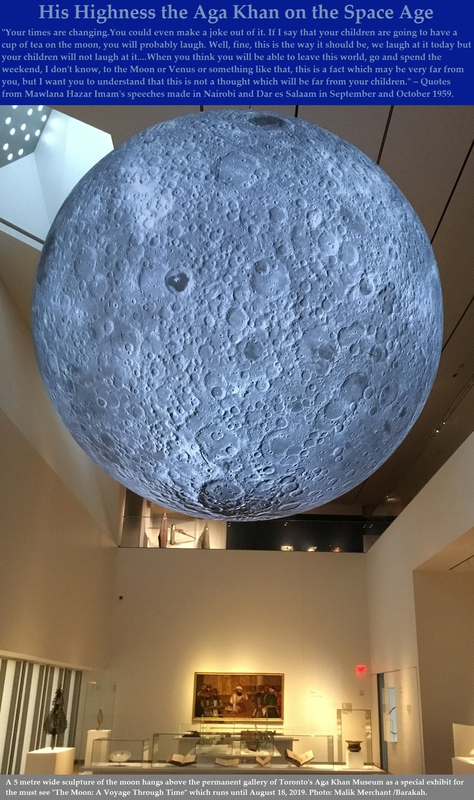 Eagle’s Nest unveils the extraordinary reality and humanity of the medieval Ismaili civilization, often hidden behind romantic images of remote ruins and the dark secrets contained behind crumbling walls. Finally, that Willey should communicate his deep affection for the countries he explored, particularly Iran, and the Ismaili themselves, is not the least quality of this book. Date posted: December 14, 2015. Flowing out of a barren desert, from a source “beyond all known horizons,” the Nile had baffled the world for thousands of years. Regular as sun and moon, in the middle of burning summer, without a drop of rain in sight, when all other rivers on earth were drying up, for no apparent reason at all, the Nile rose out of its bed every year, and for three months embraced all of Egypt. The ancient Egyptians knew when the flood would come, almost to the hour, but they never knew how much water it would bring to irrigate their fields. Egypt’s prosperity depended not only on the flood but also upon the accurate measurement of its height, for on that depended the allotment of water to its many users and the taxes they would have to pay in the coming year. …The river having reached its anxiously awaited peak, preparations were made for the annual ‘Procession to the Nile.’ In 1047, the visiting Persian scholar Nasir Khosrau left a particularly rich description of the annual Fatimid procession celebrating the Nile’s inundation of Egypt. For this great occasion, he wrote, the caliph [Imam al-Mustansir Billah] went personally to his treasury to select his symbolic regalia: parasol, turban, sceptre and sword. The sound of the palace band, which would accompany the procession, was so enormous that for three days before the event, massed drums and trumpets played continuously in the palace stables to accustom the animals to the noise. The job of decking out the processional route fell to the jewelers and tailors of the city, and this, too, always took three days and nights to arrange. When the Nile reached its peak, the golden parasol was unfurled, trumpets sounded, and the caliph, “mounted and clothed in sapphires and emeralds,” emerged to the wonderment of his subjects. Amidst clouds of incense, the procession of 10,000 men on horses moved off toward the great gate of Bab Zuwaylah, and beyond it to the flooding Nile. Leading the great procession were the sons and soldiers of the caliph’s princes (amirs). Then came the “amirs of the silver rods,” their symbols of office hung with little silver bells that jingled as they marched. Next came the “amirs of the collar,” two bearers of “the standards of praise,” and bearers of the symbolic inkstand and sword. Next came the mounted caliph surrounded by “men of the stirrup,” two at his horse’s bit, two at the neck, two at the stirrups, with the “commander of commanders” holding the caliph’s whip. The bearer of the golden parasol “took care to keep the caliph shaded from the sun,” while strategically placed in front of the caliph’s horse were two designated fly-swatters. Amidst such a vast assembly of courtiers and crowd, it was difficult for many spectators to catch even a brief glimpse of the passing caliph. But the very act of seeing him, it was believed, conveyed blessings upon the beholder. On reaching the Isle of Rhoda, the caliph dismounted, and the ceremony of anointing the Nilometer began. A mixture of saffron and mastic was handed to an official. Still in his clothes, he plunged into the flood-water and hung by his legs around the measuring column, dabbing on the perfumed mixture as readers above recited verses from the Qur’an. The caliph went on to attend the opening of the “Canal of Egypt” (Al-Khalij al-Misri), which was kept dammed with stagnant water during the river’s winter months. At the canal, one of the caliph’s most magnificent silk tents was ready to give him protection from the summer sun. (Fatimid tents, transported on the backs of many camels, were portable palaces that took seven to nine years to make.) Amid more trumpet fanfares, the caliph thrust a spade onto the winter earthen dam and at once diggers attacked the dam with their hoes, cutting a series of narrow trenches across its surface. The impatient floodwaters quickly took over, eroding deeper channels, washing the dam completely away, and within an hour the life-giving flood reached the heart of all Cairo. [Today] The Nile flood still comes, of course, but no one in Egypt sees it. Instead, it is contained in the immense inland sea called Lake Nasser, behind the Aswan High Dam. Here, Nile water collected year by year is led along neat narrow canals as unobtrusively as water coming out of a bathroom tap. About the writer: The late New Zealand born filmmaker, photographer and writer John Feeney was among the early developers of wide-screen and large-format film techniques. 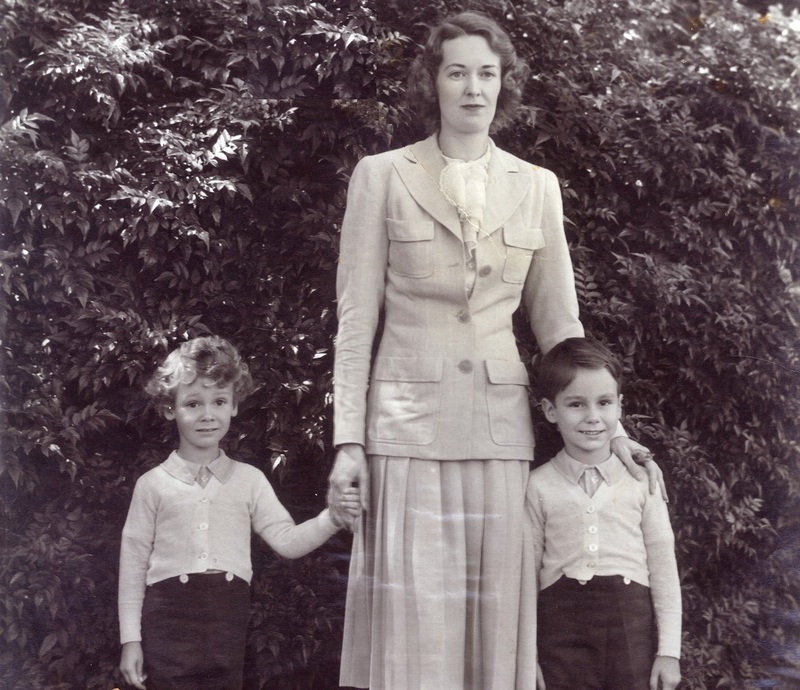 For over 4 decades from 1963 onwards until his death in Wellington in 2006 at the age of 84, he divided his time between residences in Cairo and New Zealand. His piece (images excepted) is adapted from “The Last Nile Flood” which originally appeared in the May/June 2006 print edition of Saudi Aramco World, a publication to which Feeney regularly contributed for some 35 years.